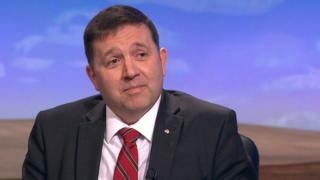 Robin Swann is set to be the next leader of the Ulster Unionist Party (UUP) following Mike Nesbitt's resignation. Mr Swann was the only candidate when the deadline for nominations closed at noon on Friday. He will be formally ratified as Mike Nesbitt's successor at a meeting of the Ulster Unionist ruling council next month. Mr Nesbitt announced he is to quit as soon as a new leader is appointed. That was after the party's disappointing performance in March's election. The UUP is now the fourth biggest party in the Assembly, having been overtaken by the SDLP for the first time. Mr Swann said he had "submitted papers" to seek election as leader of the UUP, after "receiving support from across the party, including members of our Westminster, assembly and local government teams". He told BBC NI's The Sunday News unionism needs "champions for the union". "Unionism has a lot to offer but it's also making that union attractive to everybody in Northern Ireland so they know the benefits that are there and it's about promoting a positive unionism, a non-threatening unionism and a unionism that can move forward and be progressive". You can hear more of that interview on The Sunday News on Sunday at 13:00 BST. The UUP is due to elect Mr Nesbitt's successor at its annual general meeting on 8 April. There had been some speculation that UUP MLA Steve Aiken would throw his hat in the ring for the leadership, but he told BBC's Evening Extra he was supporting Mr Swann's bid. Earlier in March, Mr Swann told the BBC he was "not ruling out" a leadership bid. The 45-year-old father of two was first elected to the Northern Ireland Assembly in 2011 and he represents North Antrim. He chaired the Public Accounts Committee during the last assembly's mandate and is former president of the Young Farmers' Clubs of Ulster. Mr Swann was one of 10 UUP members who won seats in the last Assembly elections, but he said the new leader did not necessarily have to be an MLA. "Our party rules actually allow anybody who is in good standing, and a member of the Ulster Unionist Party, to put their name forward, so there is a misconception out there," he said.